Once again, I find myself at the edge of the forest, with the recently burned and now sprouting abundant life area of the Bennett-Johnson Prairie just to the south of me. One nice thing about an edge is that the branches of trees, with leaves on them, of course, are right at ground level, making it easy to observe them. There aren’t a whole lot of trees in Minnesota compared to some other states and they stay in their respective biomes pretty nicely, so the task of identifying the various kinds of trees we have around here isn’t too hard. Some things I look for are the way the veins are arranged. These vascular bundles have xylem on the top, continuous tubes, essentially, that run all the way from the roots to the leaves, through which water and dissolved nutrients and minerals pass, drawn upward as water evaporates out of the leaves pulling the water behind it all the way up. Then the sugar made in the leaf is transported down through the lower level of the vein, in the phloem. 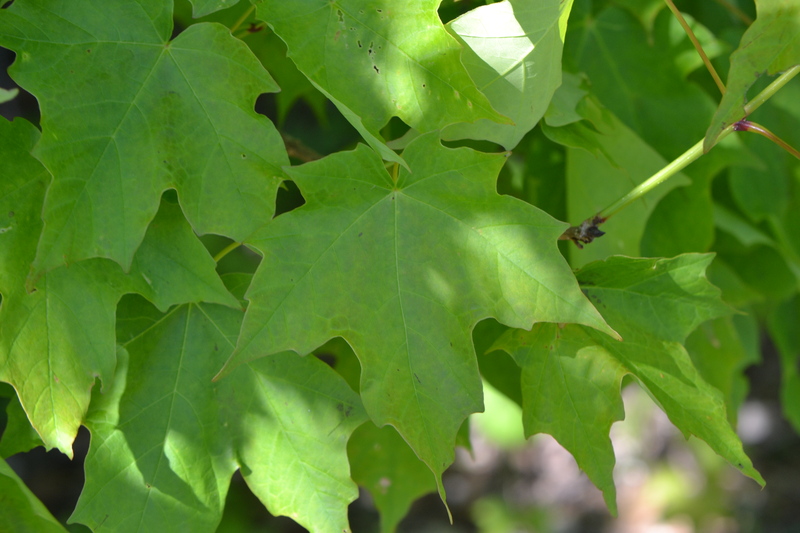 The leaves of Sugar Maple show a pattern called palmate, because they look like palm fronds; the lobes and veins radiate out from a common center at the base of the leaf. Basswood, the other major tree of the forests around here, shows pinnate venation. There’s a central vein away from which extend smaller veins. By the way, since the veins go out opposite of each other, that’s called, not surprisingly, opposite. Contrast that to these leaves of Red Oak, which have alternate veins, i.e., there’s one on one side, then a space, then one on the other. 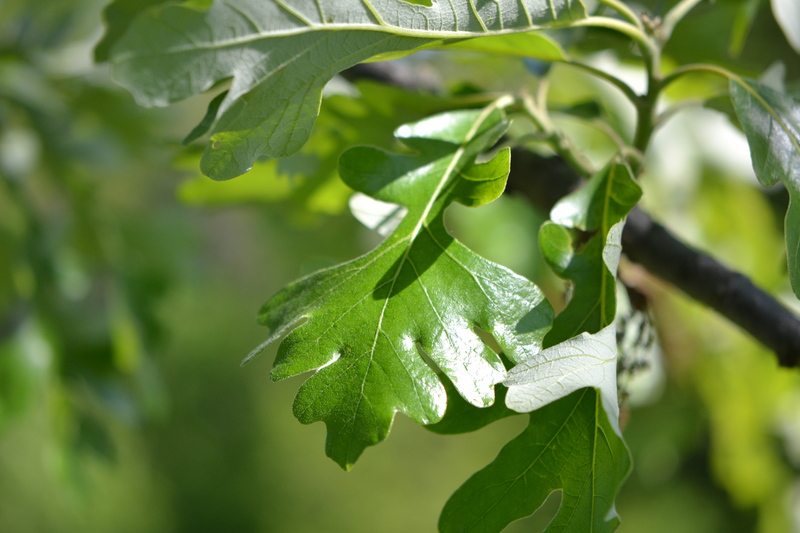 Those oak leaves have lobes, the tongue-like projections that stick out. 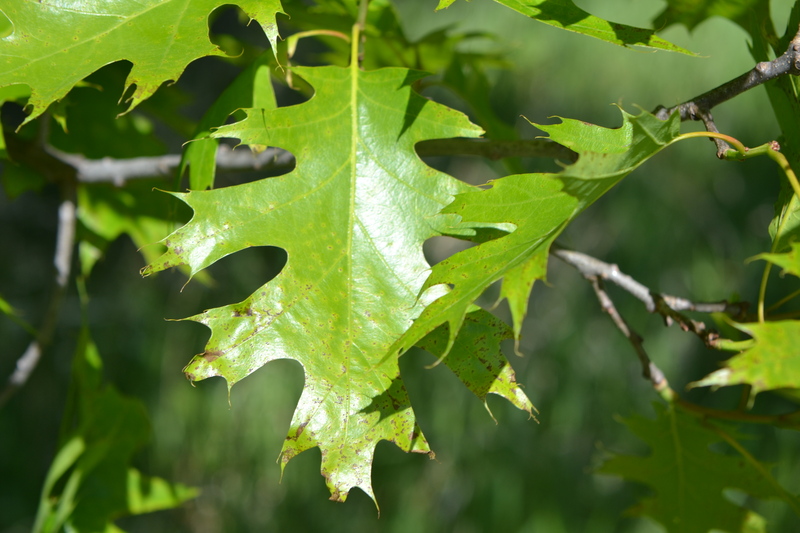 Red Oak has pointy lobes whereas Bur Oak as rounded ones. Seeing Red Oaks reminds me that this area must have been much more open for them to have started growing and that was because the area burned when they were acorns. Or I can use the margins, the edges of the leaves to identify which tree I’m seeing. 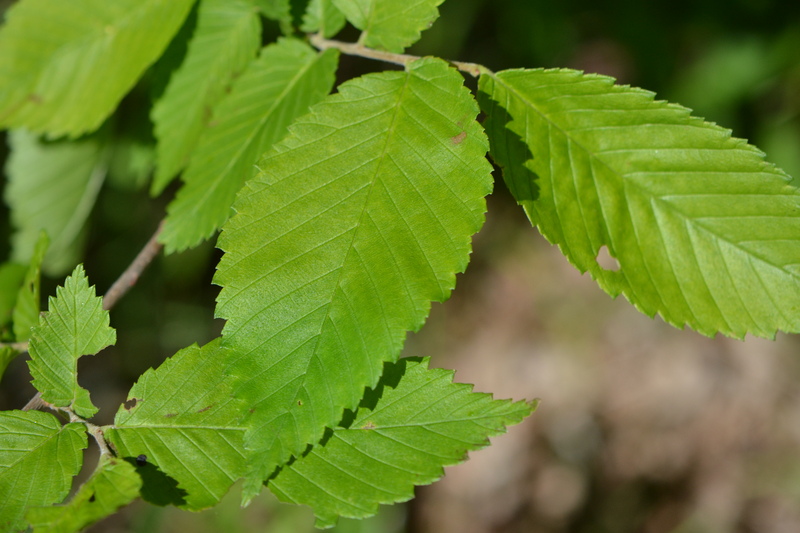 These have doubly-toothed margins, which tells me it’s in the Elm family. I’m going to have to come back and look at the leaves later on for some more clues about which of the elms it is. Will those leaves be “folded” I wonder? I find a couple of these among the leaf litter under a Red Oak. 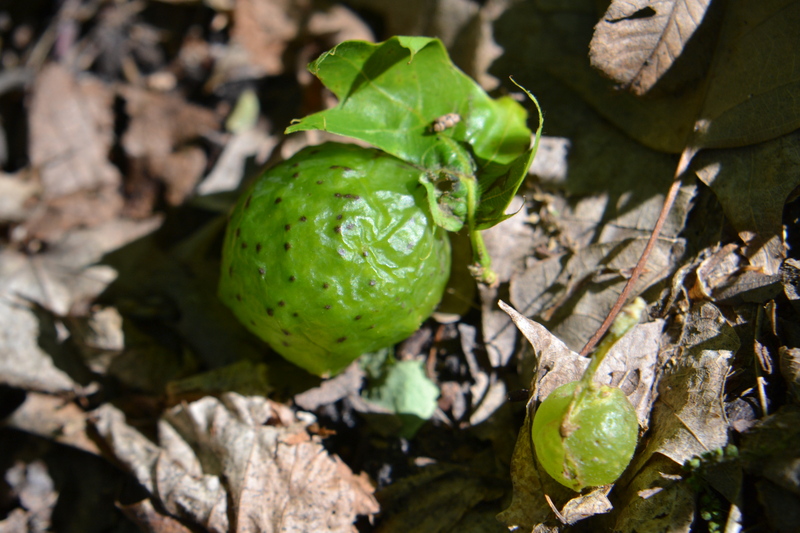 Inside I would find the larva of a little wasp, the Oak Apple Gall Wasp, whose mother laid it as an egg in the vein of the leaf. 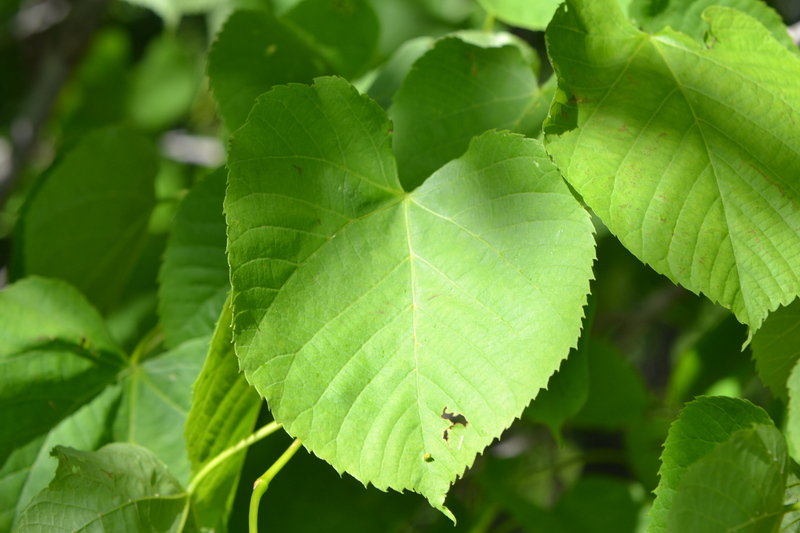 Secretions from its cuticle cause mutations in the leaf to make it grow this structure around itself.